Are you annoyed by the wandering USB hub on your desk that easily moves? Would you like some extra space to store your videos, pictures and documents but don't like the look of those external hard drives? You can create your own, one of a kind, fancy looking external hard drive with USB hub. The USB hub has its own power supply so you can keep charging your USB devices when the computer is turned off. This project even holds a little extra: a secret storage space activated by a hidden magnet. The cost was around 5 dollar because I only had to buy a few small components (resistors, LED's, switch and felt pads). If you have to buy every part the cost will be considerably more! The dimensions of the box are: height 9 cm, length 19 cm, width 12,5 cm. I made a lay-out of every side of the box in sketch-up which you can download below. Or you can create your own lay-out. Glue the lay-outs on the wooden board and jigsaw them out. 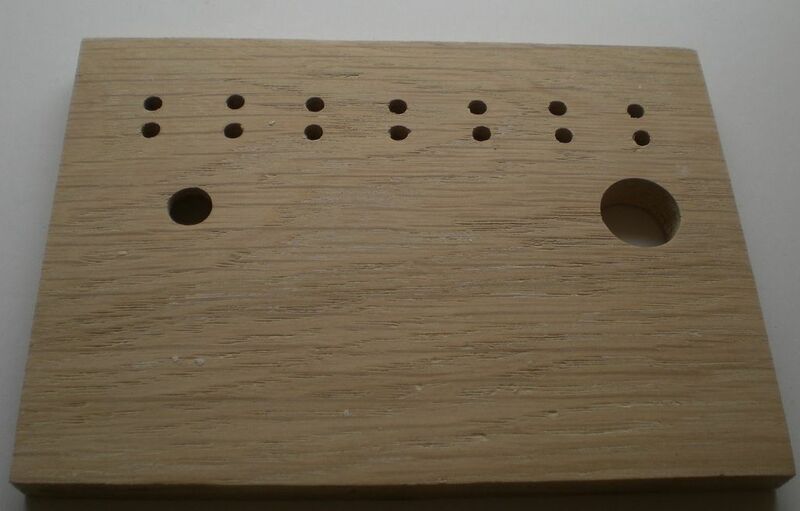 Drill holes on the inner marks with the corresponding drill bit (for example if a mark is 6 mm, you drill a hole using a 6 mm drill bit). On the wooden board which will become the back of the box hollow the hole of 8 mm using a 20 mm drill bit. The hollowed out hole has to be 6 mm deep. Sand the all the pieces and make sure you leave no paper or glue residue. Glue the front, the back, the sides and the bottom together. The top will be glued on in step 8. Solder a 19 cm cable to the positive side of the power jack and solder the other end to the switch. On the other end of the switch solder another 19 cm cable. Cut the top of the Serial ata to USB power adapter off (leave a 10 cm piece of cable on it), strip the cable: the outer wire is the negative, the inner wire the positive. Solder the negative cable to the negative side of the power jack. Solder the positive cable to the cable leaving the switch. Use shrink wire to insulate the connections. Cut the red cable and one black cable of the Serial ata power connector and strip them. The yellow cable is +12 volt, the red one is + 5 volt, the black cables are the ground (use a multimeter to be sure). Cut the top of the USB hub adapter and solder its positive side to the red +5 volts cable. Solder the negative side to the black ground cable. Considering the adapter of the Serial ata to USB adapter is rated 2 amp and the hard drive uses only about 0.6 amp, there is enough amp left to give the USB hub some extra power. If you don't want to mess up another adapter, you can solder two cables to the Serial ata power connector (one to the positive end and one to the negative end) which you can solder directly the USB hub. Solder a 75 ohm resistor to the positive side of the blue LED. Solder a cable to the other end of the resistor and solder a cable to the negative side of the blue LED. Solder the positive cable coming from the LED to the positive + 5 volt cable of the Serial ata power connector and the negative cable to the black ground. Shorten a USB cable. Use a multimeter to decide which cable is which. Reconnect the two data cables. Solder a cable on each side of the positives, solder a reed switch in between these cables. Solder a 75 ohm resistor next to the reed switch, make sure its on the female side. Solder a cable to the other end of the resistor, this cable leads to the positive side of the white LED. Solder a cable to the negative side of the white LED and connect it to the negative ends of the USB cable. The female side is that side of the USB cable were you can plug-in and the male side of the USB cable is that side that you plug-in. Shorten two USB cables: cut the middle part out and reconnect them. A small magnet is needed to activate the reed switch. I used a little piece of a hard drive magnet (any small magnet will do). Remove the bottom from a marker, place the small magnet in the bottom and put the marker back together. Test if the switch works. The magnet will not interfere with critical components because of the small size of the magnet and the distance between the magnet and the hard drive. Glue the white LED in the bottom of the box and cover it with electrical tape. Attach felt pads on the bottom and place the hard drive on top of them. Connect the hard drive to the Serial ata to USB adapter. Cover the bottom of the USB hub with electrical tape and glue it into place to the side of the box. Glue the blue LED in the front of the box. Glue the female sides of the two USB cables in the front of the box and connect them to the USB hub. Glue the switch and the power jack in to place. Connect one side of the USB cable with the reed switch to the USB hub and connect the other side to the flash drive. Glue the flash drive to the side of the box. Glue the reed switch in the top cover of the box. Glue the top to the box. Attach felt pads to the bottom. Wax the box with wood wax. This project is now finished. Enjoy this nice extension to your computer while working on your desk. Feel free to modify this project. You could install a card reader, a LED desk light, … The possibilities are endless. I must say that I like you project very, very much. That was the original idea, as you can see in step 2 there are 3 circles to drill out, I have drilled as close to the bottom as possible but the led didn't shine through. Maybe it will work with another drill bit or another kind of wood . 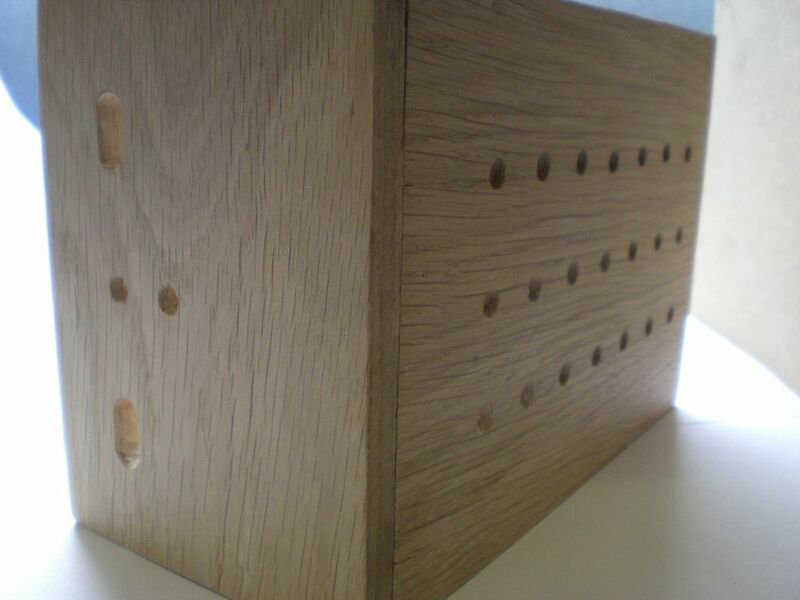 If you mean the box: No, oak is really hard so it will not be really sensitive to small bumps. If you mean the hard drive: Not more than a commercial hard drive. Maybe a Speaker or two can be inside too. I dont think Magnets from speakers damage HDD. Awesome 'ible!!!! Adding this to the "to-do" list for sure. Love the detail and all the pics.